This year, Oxfam will be working with student leaders to strengthen the opportunities and support we provide to Oxfam Campus Clubs both at the training and throughout the academic year. We will be making updates to the 2019 CHANGE training and will also incorporate more listening sessions and club presentations. We are looking for Oxfam Club members and leaders to co-create this training with us–share your knowledge and challenges, set your commitments for the 2019-2020 academic year, and evaluate your year of engagement. We encourage all new or current Oxfam Club members to apply to CHANGE 2019! The application deadline is March 6, 2019. CHANGE is Oxfam America’s program that provides leadership and advocacy training to prepare university students to promote social change locally and globally. The year long program kicks off with a week long training for accepted students. CHANGE Leaders commit to work with their Oxfam Clubs and campus contacts to host three to five Oxfam engagements, and to build a network of relationships on behalf of Oxfam during the 2019-20 academic year. The 2019 CHANGE training will take place in late June in Boston, MA. All CHANGE Leaders must commit to participate in the entire training. Oxfam will cover the cost of accepted leader’s travel (flight, bus, or train) to and from Boston, as well as lodging and meals during the week of training in Boston. CHANGE is celebrating 20 years! We have trained almost 900 CHANGE Leaders from more than 360 college and university campuses across the US. If you are an Oxfam Club member and haven’t yet received a link to apply, email change@oxfamamerica.org and request the online application. As part of the student application process, Oxfam requires students to provide a campus contact, who will fill out an online letter of recommendation and support your work on campus during the year. An ideal campus contact would be your Oxfam Club Advisor or a professor or staff person who is familiar with your Oxfam work on campus. All CHANGE Leader applications and accompanying campus contact recommendations are due March 6. How much does it cost to attend CHANGE? Applying to CHANGE is free. If accepted to the program, CHANGE Leaders will be asked to submit a one time, $100 registration fee. The registration fee is non-refundable and only applies to students who have been accepted and will be participating in CHANGE. This fee helps cover organizing supplies and resources for the training and year on campus. The fee will be due in April, after students have been notified about their acceptance into the program. We encourage students to search out university funding to help cover this cost, or to fundraise the $100. When is my CHANGE application due? The CHANGE application is due March 6. We encourage students to submit their CHANGE application one week before this to allow time for campus contacts to submit their recommendation. Once the student application has been submitted, the campus contact will receive an email asking them to fill out an online CHANGE recommendation. Please remember that applications will not be considered complete until both the student application and the campus contact’s recommendation have been submitted. What is the role of a CHANGE campus contact? A CHANGE campus contact can be any staff or faculty member on your campus. Ideally, they are already involved in your Oxfam Club or support your work on campus. In addition, this person will serve as an on-campus resource throughout the CHANGE year. Campus contacts are mentors who help make connections, provide feedback, and support for Oxfam events and activities on campus. Students and their contacts together determine how they will connect on campus. A campus contact’s online recommendation vastly strengthens a student’s application and success on campus. When will I be notified about acceptance into CHANGE? Students will be notified about their acceptance to CHANGE by April 1, 2019. We are not able to inform students of their acceptance prior to this date. What is the week of CHANGE like? The CHANGE Training is an intense, week long training that supports students to lead successful and sustainable Oxfam Clubs. Training days vary in length, many go into the evening, and full participation is expected from everyone. Students learn about Oxfam’s mission and campaigns, connect with other student and club leaders, participate in team building and leadership activities, learn organizing skills, and connect with Oxfam staff. Each day includes a variety of presentations, activities, reflection, and sharing of ideas and information. This year, participants will be asked to lead or co-lead sessions, set goals for the coming year, participate in round-table discussions, and build training resources for Oxfam Clubs. What is the time commitment for CHANGE Leaders? During the summer, students attend a week long training in late June in Boston. During the 2019-20 academic year, CHANGE Leaders continue their year of engagement by bringing Oxfam’s mission and campaigns to life on their campus! On average, students spend two to five hours per week on their Oxfam related work. Most CHANGE Leaders continue to work with Oxfam throughout their time at university and beyond. Students stay in touch with Oxfam staff, host 3-5 Oxfam events on campus in collaboration with their campus group, and complete monthly club reports. What kind of things have CHANGE leaders done on campus? Does my campus have an Oxfam Club? 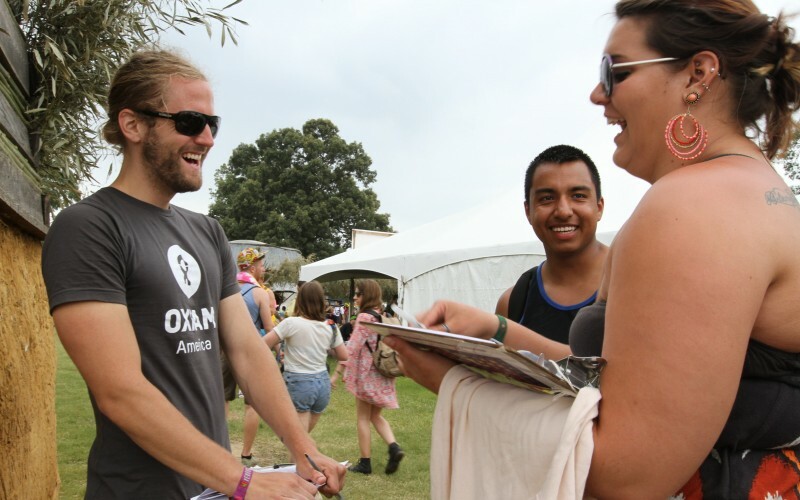 If you’re curious about Oxfam’s presence on your campus, contact us at change@oxfamamerica.org. We will be happy to help you figure out your current Oxfam Club status. If you are interested in starting an Oxfam Club, learn more and register at oxfamamerica.org/clubs. Can international students/non-us citizens apply for CHANGE? We encourage Oxfam Club members enrolled US based colleges and universities to apply. Students do not need to be US citizens. strengthening their networks on campus. CHANGE Leader efforts go hand in hand with their Oxfam Club presence on campus. While we value the work that a rising senior could accomplish on campus, seniors often struggle to find time as graduation, the job search, and other factors come into play spring semester. We have occasionally accepted rising seniors, especially if they are going to be on campus for additional semesters. Please note this on your application. What if I’m going to be studying abroad next year? Students who are going to be on campus the entire academic year will be given priority. Students who will be abroad for a semester or the entire academic year are encouraged to apply the following year. Can multiple students from the same campus apply? Yes, multiple students from the same campus and Oxfam Club may apply, though just one student per campus is selected each year. I go to a large public/small liberal arts/community college/private university. Am i eligible to apply? All students who are enrolled full-time in a US based college or university program are welcome to apply. If you have any questions about CHANGE or the application process, or if you and an advisor want to start an Oxfam Club presence on your campus, please contact us.